The use of a micro-implant (TAD) to correct overjet in an adult. (1) indicates the space created from extracting the first bicuspid. Extraction of all 4 first bicuspids to relieve crowding and align teeth. Front upper and lower teeth are moved back into their original position closing all spaces. 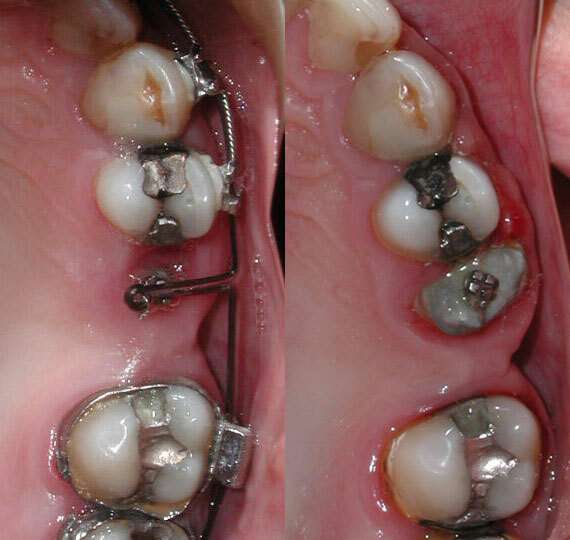 Lower incisor extraction (X), to correct crowding. Note space closure in molar area from previous extraction. Root is lifted out of the bone slowly (extruded), so that a crown can be placed and the tooth saved. Upper dental arch (jaw) is widened and the teeth aligned, so that the upper back teeth now cover the lower back teeth. 4 x-rays showing the progress of 3 impacted canines being brought into proper occlusion (bite). The upper front teeth are intruded (lifted) and the lower front teeth are intruded (lowered) in order to establish a proper overbite. (In a proper overbite only 1/3 of the lower front teeth should be covered by the upper front teeth). The upper first premolars have been extracted (1 on the top indicates the space where the first premolar used to exist), and all the upper teeth are pulled back. Notice the reduction of the overjet, (the upper front teeth are now up against the lower front teeth). In the lower jaw, the molar has been pulled forward to close the space that was created from a previous extraction. The patient has no lateral incisors (congenitally missing lateral incisors). The canine teeth (3) are up against the central incisors (1). The spaces were closed and the canine teeth were slightly reshaped to look like the lateral incisors. Lower jaw is surgically moved forward. Both the upper jaw is moved forward and the lower jaw is moved backwards surgically. Like what you see? Contact us for an evaluation today and get the smile you've always dreamed of! I can't say enough good things about Pittsburgh Orthodontic Group. My 2 children have been patients for more than a year and we have received nothing but professional service every time. Dr. Deme and Dr. Gobbie are both pleasant and have established a wonderful relationship with my kids. Dr. Deme once dealt with an unforeseen situation in an extremely timely manner. Bonus: the hygienist and the receptionist are equally welcoming and efficient. Dr. Gobbie and Invisalign gave me my beautiful smile! I'm so happy that I decided to go ahead with the Invisalign process. It was very easy and didn't take long at all. Invisalign is a great way to straighten your teeth and it's not very noticeable. Being in my twenties, it was perfect for me because most people didn't even notice that I had anything on my teeth. The trays didn't bother me at all, they were comfortable and I got used to them very quickly. Dr. Gobbie was great. He and his staff are very friendly and made me feel comfortable every time I had a visit. I trusted him completely - and I'm glad I did! I'm very happy with the way he transformed my smile! I have two boys in braces and couldn't be more pleased with the treatment. Dr. Deme always takes time to explain what he is doing so we understand the process and next steps. I feel like he isn't just an orthodontist but also an artist who is sculpting my children's mouths into a perfect smile. He has contacted us over the weekend on a couple occasions when a child has a new retainer or recently installed braces just to make sure things are going well. The office staff are flexible and friendly when I need to change appointments. I have two children being treated by them with another to likely need the same treatment soon. Great with the kids during what can be a painful process. Always willing to take the time to completely answer questions from kids and parents. Dr. Deme is absolutely amazing! I am beyond happy with my end results! I would recommend his services to any and everyone! The environment in the Mt. Lebanon office is always friendly and welcoming! Dr. Gobbie and his team are the best and most professional. Our daughter has the most beautiful smile. Because of his perfection she can not stop smiling! Thanks Dr. Gobbie! I came into their office needing surgical treatment because my teeth and my jaws were all over the place. Two years later my teeth look perfect, and Dr. Deme and Dr. Gobbie managed to align my teeth without surgery! They are truly genuine people and very family friendly all within a stress free environment. Thanks to Dr. Deme and Dr. Gobbie I will be able to smile confidently for the rest of my life! Forever thanking Dr. Gobbie for the great smile I'm sure to use everyday of my life! I had my teeth straightened here, when no other orthodontist could help. Dr. Gobbie did an excellent job. He made a plan and did what I wanted, where all other orthodontists said my teeth were straight. But not in my eyes, they weren't. Dr. Gobbie fixed them to my likings. I would recommend him to anybody who needs their teeth straightened. Dr. Deme and Dr. Gobbie have been great to work with. Both of my kids are currently having work done on their smiles. Dr. Deme explained everything they wanted to do and why during the initial consultation. The staff is very friendly and will answer any questions you have. My daughter and I really like Dr. Deme. He's very kind and takes the time to explain what is going on, and answered all our questions patiently. He also helped us think through how to play a wind instrument with braces which I was concerned about. As an adult, I was not looking forward to the idea of having braces — especially since I'd had them when I was in my 20s. I was diagnosed with severe obstructive sleep apnea, and the doctors thought that my best chance was to have reconstructive oral surgery on my lower jaw. The first step was to work with an orthodontist, and I am so happy that I was referred to Dr. Gobbie and his team. They worked with me and my oral surgeon every step of the way — sometimes literally holding my hand! I would never have made it without their help, and now thanks to them, I can breathe, eat and sleep like a normal person. Thank you so much to Dr. Gobbie, Dr. Deme, Patti and Beth — you have given me so much to smile about! Dr. Deme is great! My kids love him. The work he has done for them has gone smoothly and looks really good. I would recommend Pittsburgh Orthodontics Group to everyone. Great friendly office that is outstanding with kids. Very flexible with scheduling and responsive when the unknown occurs. Their work is of the highest quality and produces BIG smiles! My son has started the process of getting an expander and braces. He was nervous. I was nervous. Dr. Deme is SUPER awesome with kids. He explained everything that was going to happen and even went over the patient consent with my son to make sure he understood what was going on. For a process I really hoped my kids wouldn't have to go through, his experience is a million times better than mine was. If you need any type of orthodontic work done, go here. Seriously. You won't be disappointed.